Eurotech® Soccer Academies, exclusive provider of North America's premier technical soccer training system, announced its 2016 Northern Virginia/Washington D.C. soccer camp schedule - July 31 to August 5th at the Foxcroft School in Middleburg, Virginia. Enrollment will be strictly limited to 80 campers, so early registration is strongly recommended to ensure placement. Eurotech® Soccer World, developer and exclusive provider of North America's premier technical soccer training system, has released its 2016 summer soccer camp schedule for the Virginia and Washington D.C Area. 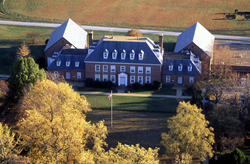 Camps will be held from July 31st through the August 5th on the exceptionally equipped and equally beautiful campus of the Foxcroft School in Middleburg, Virginia. Eurotech’s camps will take place from July 31st through the August 5th and are open to boys and girls ages 9-18. Campers can choose either a 4-day or 6-day session, with full day, extended day and overnight options available for all. Like all Eurotech® offerings, the Virginia soccer camps are designed for competitive individual players as well as club and high school teams, with separate programs for field players and goalkeepers. Enrollment will be strictly limited to 80 campers, so early registration is strongly recommended to ensure placement. Also, campers who act quickly can also take advantage of several discount opportunities, including an Early Registration discount of $25, a Returning Camper discount of $50 (for 2016), and a Family Camper discount of $25. Call or email for soccer club discount program information. For complete information about Eurotech’s Virginia soccer camps, including pricing, visit http://www.EurotechSoccer.com.